Don't ever be fooled. The people you meet on twitter are not your friends. They line up with their pretty avatars, make you laugh once in a while, even share the occasional nugget of wisdom, but ultimately they are plotting against you. Yesterday I was battling a major craving for chocolate. I tweeted about this, trying to reason my way to "yes, you may run upstairs to the tuckshop, buy the biggest, baddest chocolate you can find and devour it in two bites." And what do my so-called twitter "friends" do? Persuade me to find a nobler alternative? Distract me until the craving passes? Oh no. Those conniving "friends" practically forced me to dive into my handbag, fish out my wallet and run to my nearest drug dealer our tuckshop. At which time I proceeded to inhale that chocolate like.e it was fresh oxygen. The sneaky folks over at Pepenero even had the audacity to congratulate me on caving. The nerve.. Which can only bring us to the conclusion that chocolate = good, Twitter enablers "friends" = evil. Do you ever have one of those days? Well then, step right this way, because you are in for a treat. 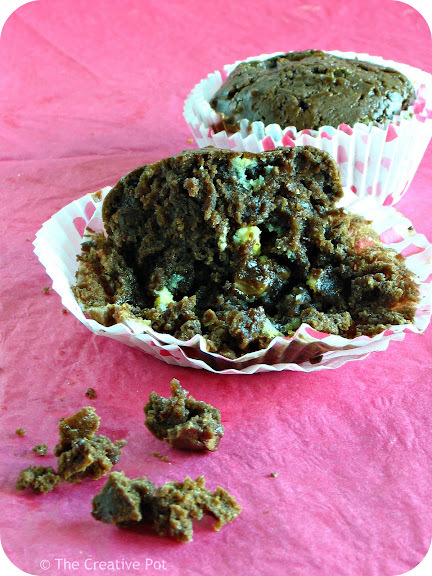 A seriously sinful, downright devilish rendition of a chocolate muffin. Now, Nigella's version is pretty chocolate-y already, but I thought it couldn't hurt to make it even more so. After all, there is no such thing as too much chocolate in my book. * I added an entire (big) bar of Top Deck chocolate broken into chunks to this dough. Well, almost an entire bar - a girl has to keep up her energy you know! Either way though, the result is chocolate heaven. 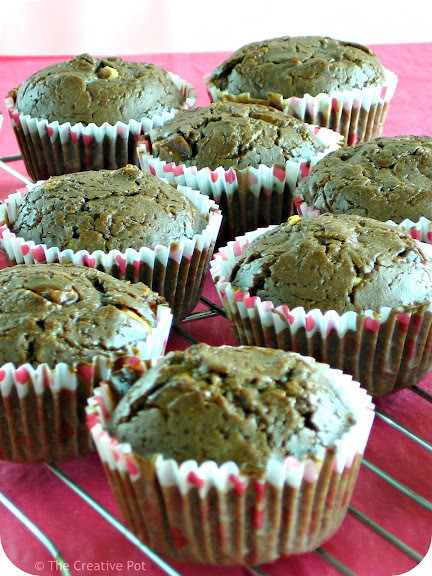 Dark chocolate muffins, studded with chunks of milk and white chocolate. A chocolate trifecta if you will. I encourage you to eat these muffins while still warm (or pop them in the microwave for a few seconds to re-heat slightly) so you can experience the full effect of the melted chocolate chunks oozing their way down your throat. It is an experience not to be missed. Trust the addict on this one. *If you have even the slightest doubts regarding the truthfulness of this, I urge you to leave this blog right away. Do not pass "GO", do not collect $200. Just go back to your miserable chocolate-less existence and forget you ever came here. 1. Preheat oven to 180C. Line a muffin tray with cupcake liners. 2. Sift the dry ingredients together in a large bowl. 3. Add milk, oil, egg and vanilla essence and beat well to combine. 4. 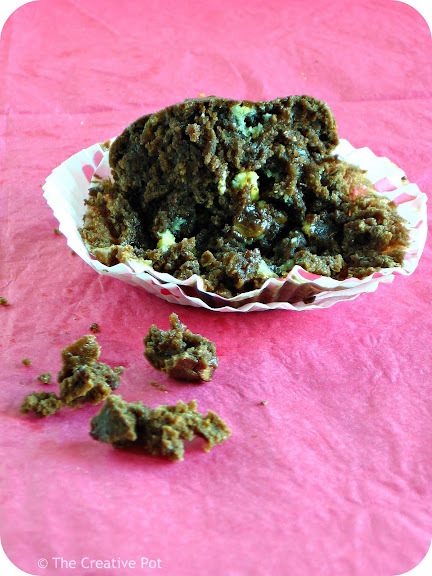 Fold the chocolate chunks into the batter, then divide amongst the cupcake wrappers. Bake for 20 minutes at 180C (350F) or until a toothpick inserted into the middle comes out clean. I will have to make these though. I feel a chocolate craving coming on. Spoken like a true junkie.......I hope these babies fix your craving!!! If ever you have a serious craving again go and have Chocolate Springrolls over at Wang Thai....oosing with chocolate!!! Joanne - I blame twitter for most of my transgressions. You'd be awesome on there - maybe you can encourage me to exercise! Nina - Thanks for the tip; those sound divine! I do hate you. I really do. This isn't fair, you know. You show me these things, when you KNOW I can't bake. What will I do now?! I have to go and buy ANOTHER cupcake!! Polkadot - It's the cross he has to bear, poor thing. Too funny! Yeah, I don't think my foodie followers on there would be convincing me not to eat something. Ha, ha. These look so good! Marietjie - I agree, the craving has to be pretty strong to whip these up at 11 pm. Although I can't say I've never done that either..
And yet you come right back here to connive and cajole me into the same trap. Marisa this sounds delicious. Love your style of writing. those muffins look incredible, so chocolatey and gooey!! I think I'm gonna have following you on tweeter to help convince you to make more! Chocolate, chocolate, chocolate...who can live without it. These sound wonderful. Thanks for stopping by my blog. I shouldn't be here when I am hungry. damn you, woman. Hahaha! It's always an adventure with Twitter. Mmm salivating here - only the lack of any form of chocolate bar in my larder is preventing me from baking them right now(because I've eaten it, not because I'm an anti chocolate freak...!) I've never bought Top Deck but maybe this is the time to try it? !